we have an error as undefined reference to `sqrt‘ (or any other function that called from math.h library) Interestingly if we have a static variable inside the sqrt like ‘sqrt(12.2)’ the compiler don’t give us any error. This happens because when we give the gcc ‘-lm‘ option, we link the libm.a and libm.so to the compiler. “.a" files are static libraries, as opposed to “.so" files which are dynamic libraries. Normally gcc looks for dynamic libraries if available unless passed -static. In ”sqrt(12.2)” case gcc is called ‘libm.a’ and not call the function sqrt in the run time, simply assign the value to the static variable. Right click on your project in Project Explorer and select Properties. 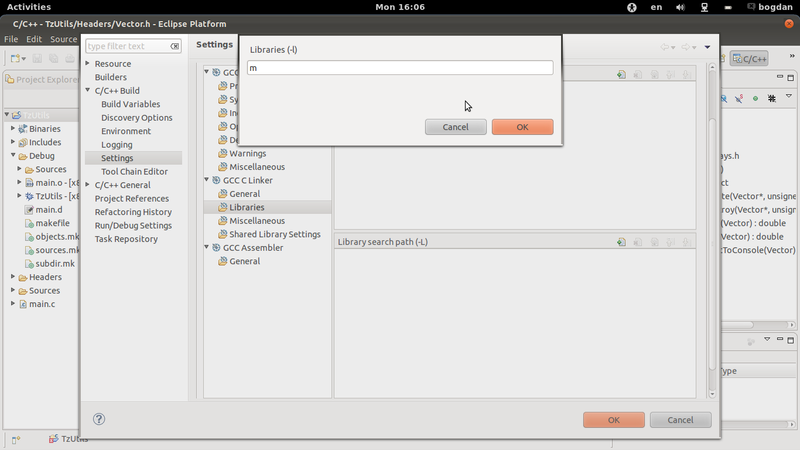 Go to C\C++ Build -> Settings -> Tool Settings -> Gcc Linker -> Libraries and click on green plus button to add a new library. When the dialog pops up, write m, and Eclipse will automatically add the –Im flag. bir başka sorun da touchpad i istenildiği zaman açma/kapatma. onun için de buradaki çözümü uygularsanız sorununuz hallolacaktır. After all those Video and Flash player issues in Ubuntu whether Firefox or Google Chrome, I finally got a solution to all of those. The 64 bit Flash Player issue also has the same solution. So let’s get started. fron the release list download the one for 64 bit linux extract it get the ‘libflashplayer.so’ file. a. Open terminal go into the folder/directory where ‘libflashplayer.so’ file is using ‘cd’ (eg. cd Downloads or cd Desktop )command or any other way you like. Note: Look carefully at bold folder ‘firefox-4.0-4.0b13pre’, this is my installation you can change this to your installation like ‘/usr/lib/firefox-3.6.15pre/plugins’ etc. rest remains same. a. same as for firefox. Atmel Fast VirtualNet AT76C504/505/506 — Aug. 21, 2002 — Single chip baseband Media Access Controllers (MAC) supporting PCMCIA or Compact Flash, USB, and PCI or mini-PCI. Include an interface to RF Micro Devices (RFMD) front-end chipsets, and target printers, PDA’s, and calculators. details. Freescale MC9328MX1 i.MX1 and i.MXL — Nov. 17, 2003 — Based on an ARM920T core with 16KB instruction and 16KB data cache, and very lower power requirements. Targets mobile devices. Integrates SDRAM controller, LCD interface, video port, dual UARTs, dual SPI ports, USB device port, I2C bus, general purpose I/O, and memory card interfaces, among other peripherals. The iMXL includes a subset of the i.MX1’s built-in functions. Details here, here, here and here. Intel XScale IXP28xx — Sep. 16, 2003 — Intel’s IXP2800 network processor is meant for network core applications, such as ultrahigh-speed switch/routers; its IXP2400 network processor is meant for multiservice switches and similar equipment at the network edge; and, its IXP2850 is meant for virtual private networks (VPNs), secure web services, and storage area networks (SANs). Details here, here, here, and here. NeoMagic MiMagic 3 — Jun. 27, 2002 — 110 MHz ARM 720T CPU (with MMU) with on-chip 1K boot ROM and interfaces for SD Card, MMC, CompactFlash, SmartCard, USB (host/function), 3 high-speed UARTs, IrDA, AC-97, UCB1200, color/mono LCD, power management control, plus various timer/counters, RTC, IRQ inputs, GPIOs. details. Oki Advantage ML67406x and ML67405x — Mar. 10, 2005 — Powered by a 33MHz ARM7TDMI core with legacy 8- and 16-bit support. Includes an array of serial communications interfaces, including multi-master I2C, SPI, I2S, and 9-bit UARTs enabling communications with legacy 8-bit MCU devices. The 405x series adds an external 8-/16-/32-bit data bus, enabling it to support enough external Flash and RAM to run uClinux. details. Samsung S3C2440 — July 21, 2003 — A 533MHz ARM920T 16/32-bit RISC microprocessor core targeting PDAs, smartphones, and mobile handheld devices. On-chip interface functions include a camera interface, a display controller for TFT and STN LCD displays, an SD/MMC/SDIO card controller, USB host and device controllers, a touch-screen interface, and a NAND Flash interface and boot loader. details. Samsung S3C4510B — May 2, 2003 — A 50 MHz SoC based on an ARM7TDMI core. Available on a Net-start evaluation board pre-installed with uClinux from Wiscore. details. Cavium Octeon CN34xx and CN38xx — Sep. 12, 2004 — A multicore network security processor for integrated network processing devices. Based on cnMIPS64 (“Cavium Networks MIPS”) cores, of which the CN34XX has 2-4 and the CN38XX has 8 – 12. Also integrates PCI-X or SPI, up to 8 Gigabit Ethernet, support for up to 16GB of 400MHz DDR ECC RAM, and a wide variety of configurable acceleration and security processing blocks. details. AMCC 440GR — Mar. 17, 2004 — A low-power SoC targeting networking and storage. Based on a PowerPC 440 superscalar core, clocked at up to 667MHz, with dual 10/100 Ethernet and a PCI bus. Supports DDR266 memory. details. Freescale MPC5200 — Jul. 22, 2003 — 400MHz PowerPC 603e core, uses less than 850 milliwatts, ROM/RAM/Flash controller, Ethernet, dual CAN (controller area network) ports, J1850, dual USB 1.1 host ports, ATA, I2S (Inter-IC sound), I2C (Inter-IC serial), SPI (serial peripheral interface), AC97 CODEC, 6 programmable serial controllers (PSCs), general puropose I/O / real-time clock / timers, PCI bus controller. Details here and here.